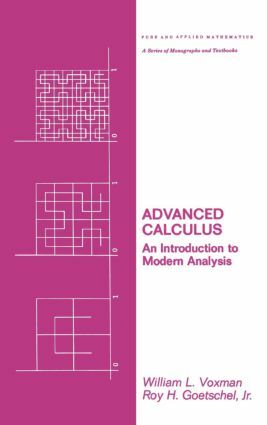 Advanced Calculus: An Introduction to Modem Analysis, an advanced undergraduate textbook,provides mathematics majors, as well as students who need mathematics in their field of study,with an introduction to the theory and applications of elementary analysis. The text presents, inan accessible form, a carefully maintained balance between abstract concepts and applied results ofsignificance that serves to bridge the gap between the two- or three-cemester calculus sequence andsenior/graduate level courses in the theory and appplications of ordinary and partial differentialequations, complex variables, numerical methods, and measure and integration theory.The book focuses on topological concepts, such as compactness, connectedness, and metric spaces,and topics from analysis including Fourier series, numerical analysis, complex integration, generalizedfunctions, and Fourier and Laplace transforms. Applications from genetics, spring systems,enzyme transfer, and a thorough introduction to the classical vibrating string, heat transfer, andbrachistochrone problems illustrate this book's usefulness to the non-mathematics major. Extensiveproblem sets found throughout the book test the student's understanding of the topics andhelp develop the student's ability to handle more abstract mathematical ideas.Advanced Calculus: An Introduction to Modem Analysis is intended for junior- and senior-levelundergraduate students in mathematics, biology, engineering, physics, and other related disciplines.An excellent textbook for a one-year course in advanced calculus, the methods employed in thistext will increase students' mathematical maturity and prepare them solidly for senior/graduatelevel topics. The wealth of materials in the text allows the instructor to select topics that are ofspecial interest to the student. A two- or three�ll?lester calculus sequence is required for successfuluse of this book.